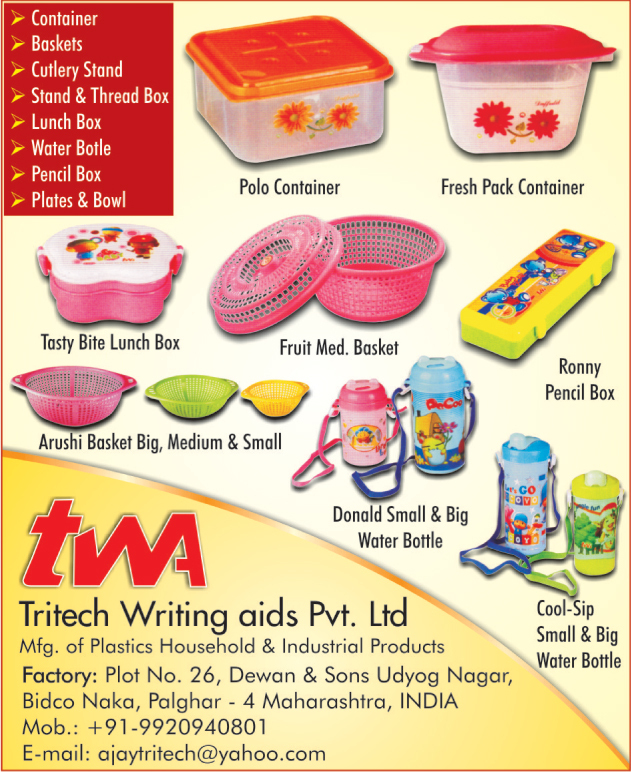 Tritech Writing Aids Pvt. Ltd. Plastic Polo Containers, Plastic Baskets, Plastic Cutlery Stands, Plastic Thread Boxes, Plastic Stands, Plastic Lunch Boxes, Plastic Water Bottles, Plastic Pencil Boxes, Plastic Plates, Plastic Bowls, Plastic Fruit Baskets, Plastic Cool Sip Water Bottles, Polo Containers, Baskets, Containers, Cutlery Stands, Thread Boxes, Lunch Boxes, Water Bottles, Pencil Boxes as an active Manufacturer, Supplier, Dealer, Distributor, Trader and Seller etc. (*Importer/Exporter/Service Provider).